The new year is the perfect time to evaluate your organisation tactics and adjust them so you get more time for YOU. Looking at ways you could be more organised could help you get that hot coffee you've been craving or give you a whole afternoon for shopping! 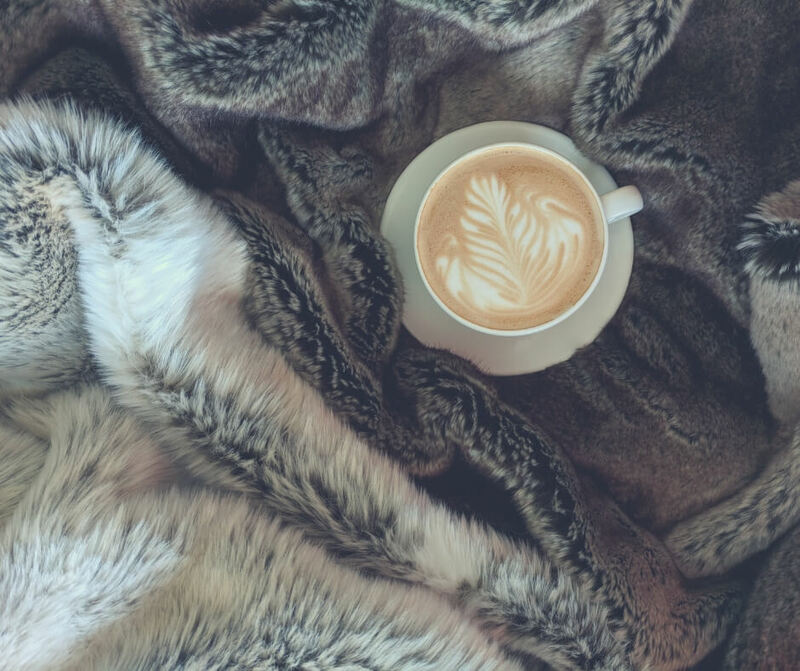 Do you spend all year long wishing there was some way you could get into a proper routine so that you could sit and have just 5 minutes to sit down and enjoy a coffee? With laundry, ironing (ugh! 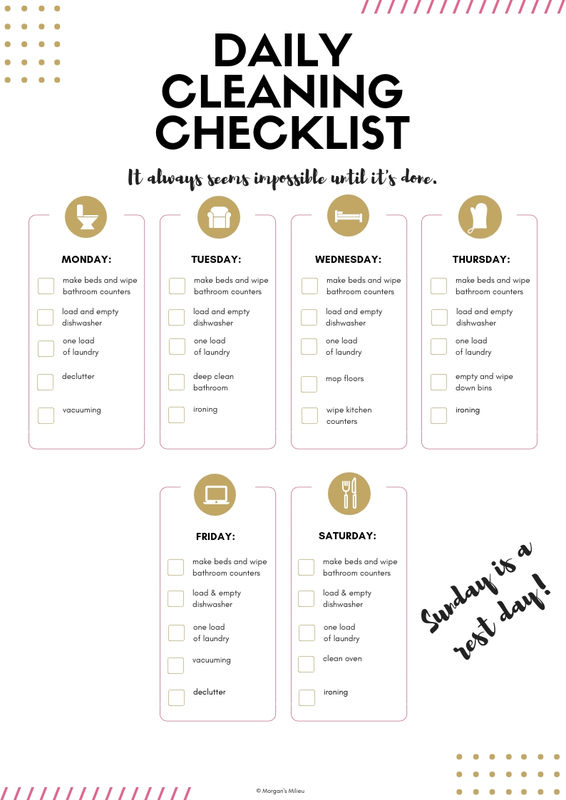 ), dishes to clean, packed lunches to make, kids to get to school, as well as dusting, vacuuming, and mopping floors, there are so many chores to do it's easy to get lost and run around not really knowing which job to tackle first. As a result you get no time for you because you're so busy playing catch up and trying to tackle that washing mountain. 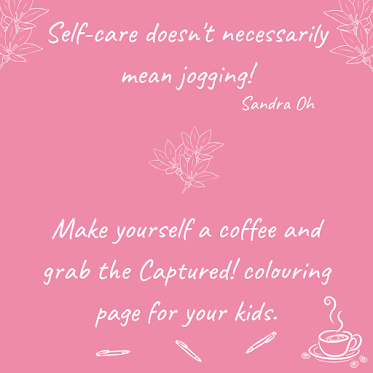 But with a little planning and organisation you can get all your chores done, and even catch up on the ones that are piling up, giving you time to enjoy a coffee or even make a shopping trip - and I don't mean grocery shopping! So here's my tips on how to get organised for the new year, so you'll have more time for YOU. Okay, so no one likes cleaning (or at least I don't!) but organising your cleaning so that you know what chores to do on what day will make the cleaning go faster and eventually you'll get on top of it. 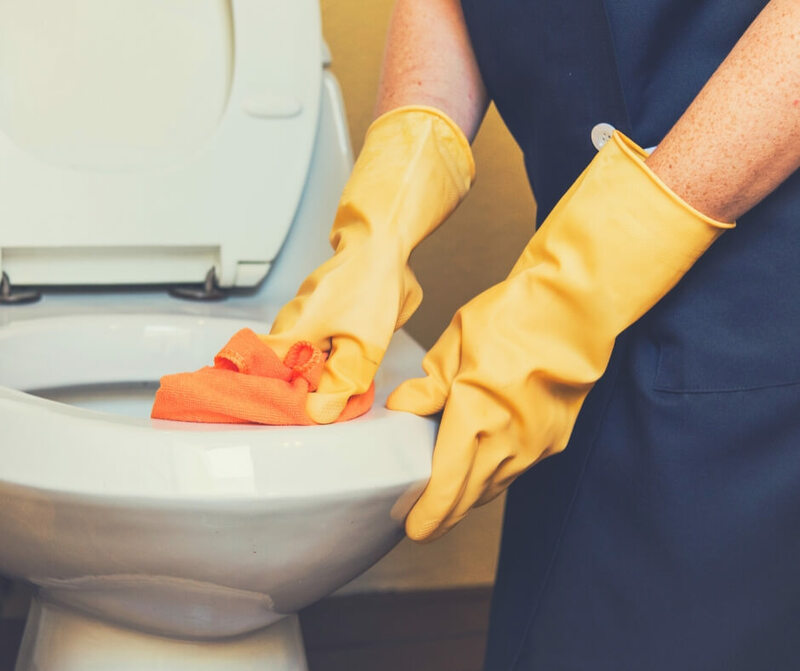 A cleaning schedule helps, and after a while you won't even need a list because you'll get into a routine and know which jobs to do on which days. One of my most hated chores, cleaning the toilet, but with a good routine it's not so bad! I do most of my cleaning in a morning, getting most of it out of the way so that I can grab a coffee and chill out while the boys are at school. I keep my daily cleaning checklist on my iPad, because I use it every day, and check off my chores when they're done - much like my boys do with their chores lists. By the time I have to pick up LP from school my chores are done, and after dinner is over with I can relax for the rest of the evening. This gives me time to spend with my boys, the Hubby, but also it gives me time to spend doing the things I love - like drawing, playing games, or just enjoying a movie. Knowing what to cook when, or even coming up with interesting meals for everyone is a job in itself, and without organisation can result in food not being used or eating the same meals again and again because it's the only thing everyone will eat. Our evening meals were always a pain point for me, it would come around to dinner time and I hadn't worked out what we'd be eating. This meant I was scrambling to cook something interesting and somehow always failed to cook something everyone would enjoy. By the end of the week I'd have to throw away unused food, sometimes whole packs of chicken fillets that I'd forgotten to use by the use-by date. Then I started planning our meals. Every Sunday afternoon I will spend an hour or so working out what meals to cook for the week and then making a shopping list so I don't forget anything. Sometimes it can take a long time, but I know that even if it takes a couple of hours it will save me time in the long run. I plan what I'll cook Monday - Friday, I always leave weekends free so we're not tied to eating at home and can have a day out if we choose. By planning which meals you're going to cook, and spending a little time doing your shopping list, you'll have more time. 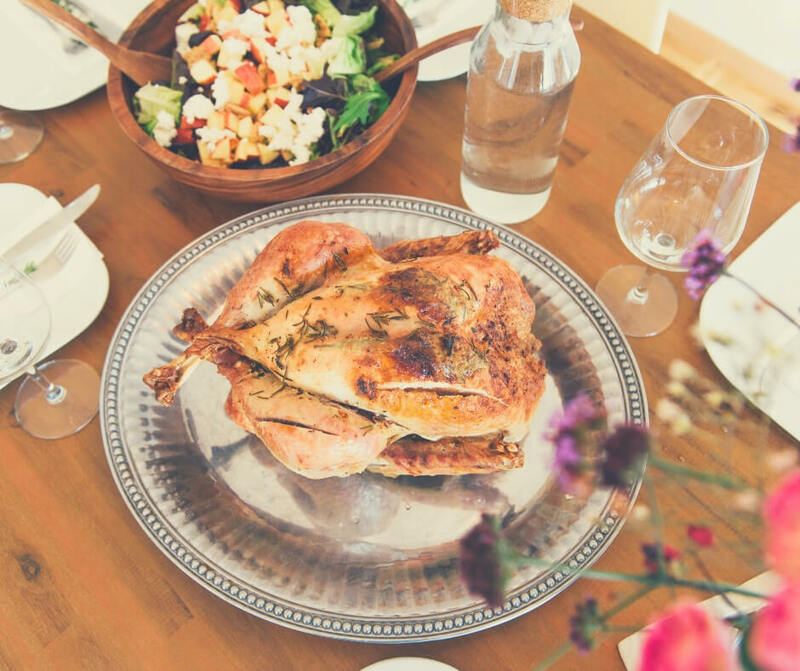 You spend a little time planning and writing your list, but when it comes to actually cooking a meal you'll know what you're going to cook and can just get on with it - rather than spending 30 minutes or more discussing what you're going to do for dinner. I have found meal planning so useful, and have got into such a routine that I do it automatically every Sunday now. It also helps us with not getting into a rut, if we become bored of a meal - like spaghetti bolognese for example - then I just head to a recipe site (think Tasty) and find something new for us to try. It makes life so much easier meal planning and you get more time for you because your time isn't wasting on shopping or deciding what to cook. Something that can eat up a lot of time in a morning before the school run is sorting out packed lunches. You spend a good 20 minutes making sandwiches or a nice pasta salad, then have to rush out the door in order to get the kids to school on time. Make up sandwiches and put them in the fridge for the morning. But what if you already had a packed lunch in the fridge that you could grab as you headed out the door? LP likes his packed lunches occasionally and after lots of time spent on making sandwiches in the morning I decided I was doing it all wrong. I would spend most of my morning in the kitchen and not see anyone else in the house because I was so busy. So I started making the packed lunch ahead of time. When I'm cooking our evening meals, or waiting for something to simmer, I make up LP's packed lunch. If he's having sandwiches they're fairly easy and I'll just keep them in the fridge overnight, but there's also pasta salads and all sorts of stuff he likes to try so by making it ahead of time I get to talk to my family in a morning rather than being stuck in the kitchen. If you make up the packed lunch the night before you'll have more time in a morning to spend with your family. Do you ever find yourself spending 10 minutes looking for, or making, snacks for the kids to have after school? When LP comes home after school he is always hungry, and more often than not asks for a snack. Sometimes breadsticks will do, other times he wants something a little more filling. So having a snack pack put together and stored in the fridge - something he can just grab himself - saves so much time. Cheese sticks, ham and crackers, whatever it is if you have little snack packs put together and stored somewhere the kids can reach you'll save yourself time - which you can use on yourself! Find yourself forgetting appointments or can't remember what day your kids' parent's evening is? Use a diary or planner. My favourite planner - the Passion Planner! My life has changed since I started using a planner and writing everything down. From birthdays and appointments to errands and deliveries I keep it all in my planner - including my meal plan for the week. At a glance I can see if I have anything important planned for the day, if there's anything I need to buy, or if I have time for a fancy coffee with friends. It has transformed the organisation of my life. I use a Passion Planner, and it gives me space to write down my hopes and dreams, even plans, for the future. I absolutely LOVE IT and have been using it for 3 years now - I have my new one for 2019. 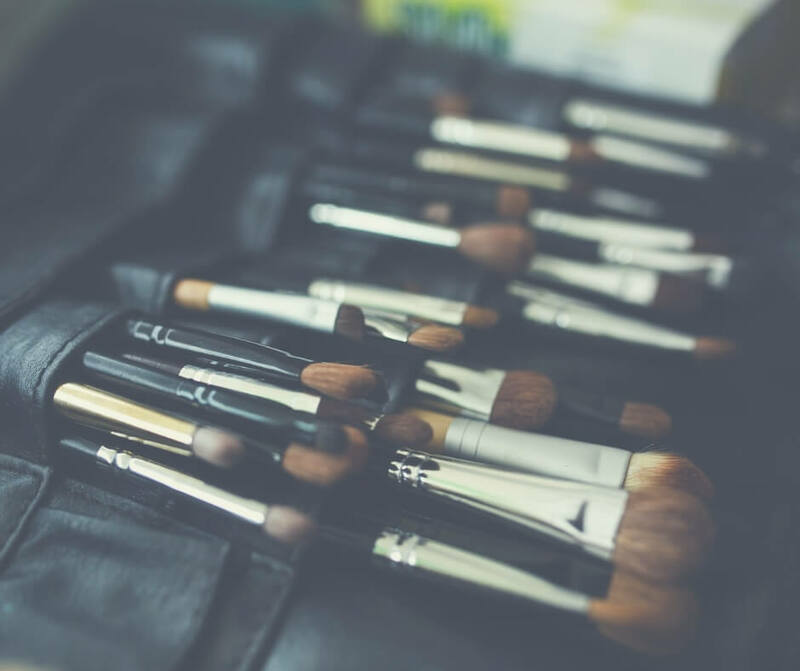 With the time you save on chores and packed lunches why not clear out your make up bag? By taking a look at the make up you use and throwing away the things you don't you'll be able to get ready quicker in a morning because you won't be searching through a bag of things you don't use. I'm not a big make up wearer, I just stick with mascara and a little concealer under my eyes - because as a mum that's where I need it most! But even though I don't use make up a lot I still have bits that are either out of date or things I don't use and this year I've been through my bag and thrown away the things I don't need. Now my mornings go quicker, I can be ready in 15 minutes rather than 30! Just the same as your make up bag, why not have a wardrobe clear out. Throw away clothes you don't wear any more or ones that are worn. Only keep clothes in your wardrobe that make you happy, that way when you get dressed in a morning you'll be happy, and it'll take you less time to get ready because you're not searching through your clothes trying to find something appropriate. I clear out my wardrobe every year, I put all my summer things into storage and pick out only my favourite jumpers and jeans to wear during the winter months. This year I'm liking v-necks, and have quite a few to choose from - and they all make me smile. What clothes are making you smile? Now this might not help with organisation but take a minute to go through friends and people you follow and unfriend/unfollow people who don't bring light into your life. Ditch the dead wood. The new year is a great time for a new start so having a social media clear out will make you smile - and you can then find new, inspirational, people to follow! I love Michelle Reeves and Aby Moore - they're both inspirational and motivational women who make me smile every day. In order to get organised for the new year, so you'll have more time for you - you need to make some time for you! Get into the right mind set and getting organised will be easy. I want you to take 10 minutes for yourself at some point during your day and think about the best ways you could organise your life to make things easier for you. It could be having a chores checklist, it could be sorting out packed lunches the night before, but think about what could give you five minutes to have a hot coffee if you started doing it right now. Now doesn't that coffee look good? Focus on enjoying that hot coffee and you'll motivate yourself to get started today! I would love to hear how you get on organising for the new year - and what you do with your time! What will you be focussing on so you have more time for YOU? If you enjoyed this post you'll like Why it's important to get 10 minutes to yourself or if you're looking for simple ways to get organised check out 13 simple ways to become an organised mama. Stop by Facebook and let me know how your organisation is going. 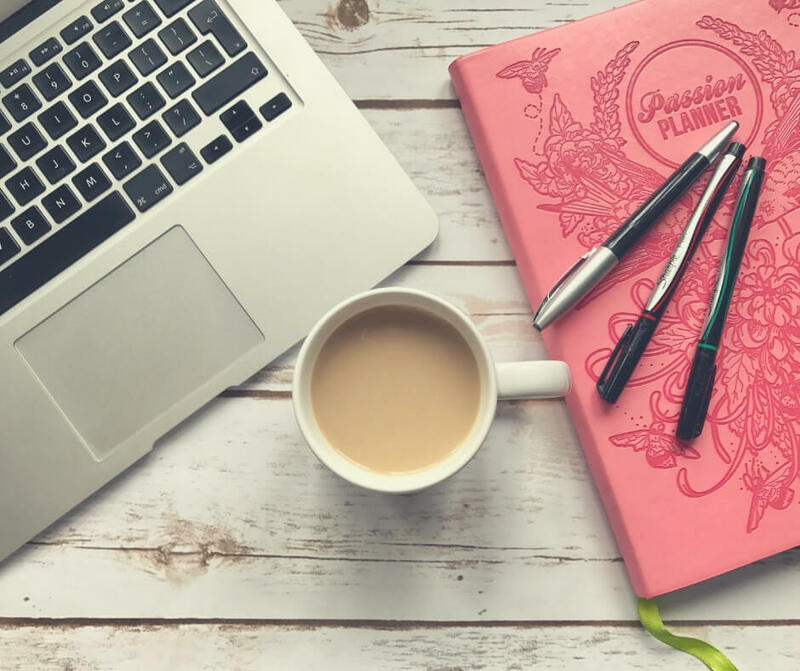 To help you get organised for the new year, so you can have more time for a hot coffee, grab this Organised Mama Pack, which includes daily, weekly, and monthly chore lists as well as shopping planning and a daily planner! 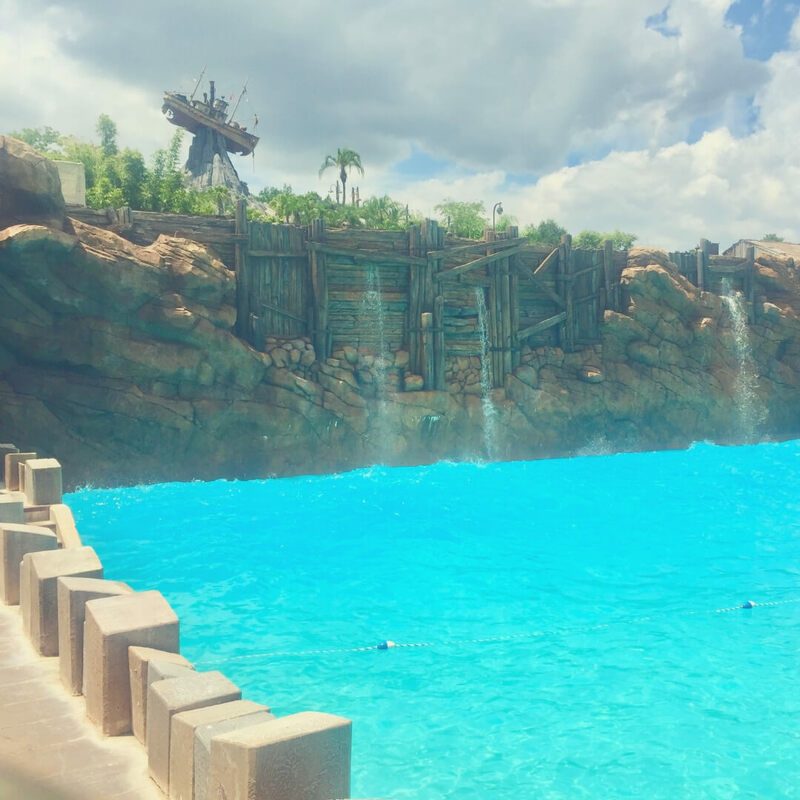 The water parks in Walt Disney World often get forgotten about, they're not visited as often as the other parks and to be honest I think if you don' visit at least one of the water parks, either Typhoon Lagoon or Blizzard Beach, you're missing out. 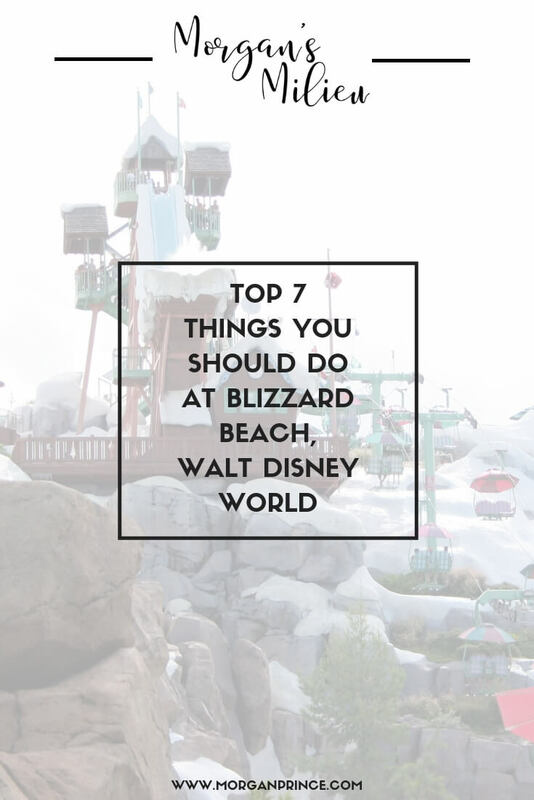 With that in mind, and as a way to entice you, here's 7 things you should do at Blizzard Beach. I always get excited when I walk towards this entrance. 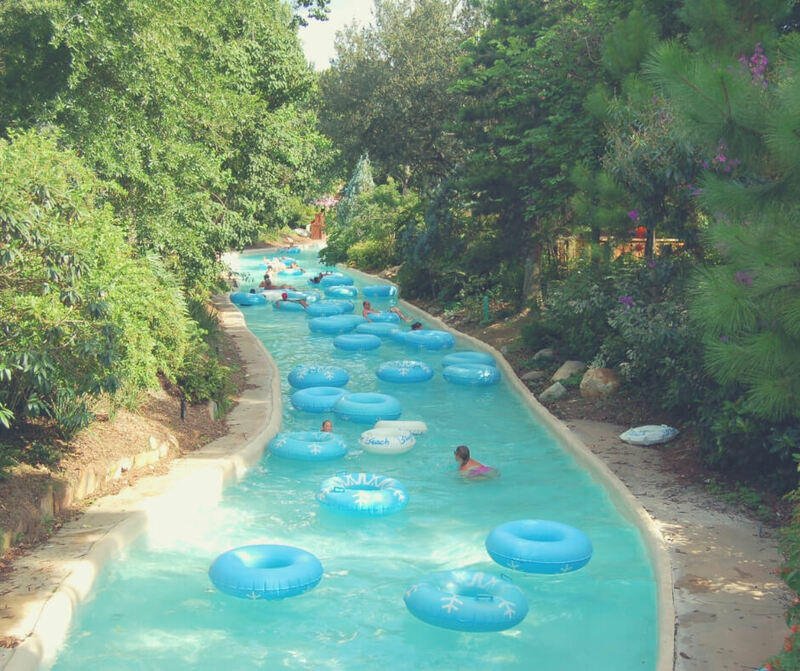 The first ride we always head to when we visit Blizzard Beach, is Teamboat Springs - a family raft ride that is full of twists and turns to keep you smiling all the way down. There aren't any sudden drops, you do see them all coming, but the turns keep you on your toes, and there's usually a big splash at the end. It's become somewhat of a tradition for us to go on Teamboat Springs first, so much so that my boys head straight there when we go to Blizzard Beach! Hop aboard a mat and race down the slide alongside your family and friends. There are 8 slides next to each other and you can race amongst yourselves or race other people too. We love Toboggan Racers and LP always asks to ride, he loves the fact that we can race each other. Be prepared for being splashed in the face as you get to the bottom, but it is lots of fun. Using the same mats you use on Toboggan Racers these slides are different in that they are winding. It's not a straight slide to the bottom, you speed around corners and down hills before splashing into a pool at the bottom. There's lots of splashes to the face, but it's lots of fun and the splash at the end isn't too bad - you just float across the pool towards the steps. Definitely one to try. With a choice of 3 different slides you're sure to have fun at Runoff Rapids. Grab a ring at the bottom and head up the steps to make your choice. There's one 'open' slide and two are tubes, but they're all winding and filled with dips, so you'll have some fun. My favourite has to be the first closed slide, there are turns and dips (and plenty of screaming), but as you splash into the pool at the end you're filled with adrenaline and you'll have a huge smile on your face! If you like body slides none top the Summit Plummet - according to my boys. I won't dare go on Summit Plummet but my boys love it and take any opportunity they can to ride. It is basically a huge body slide with one large drop, definitely one for the thrill-seekers in your party. I've never braved it, but the boys love Summit Plummet. Much like the Summit Plummet this is a body slide, only this slide is more like Toboggan Racers rather than just one drop. Again my boys enjoy this slide and look forward to it every time. The drops aren't as big as Summit Plummet so if you want to work up to the big slide it's a good start. One of my favourite places is relaxing in a ring on Cross Country Creek! After all the excitement of the slides and raft rides you're going to want to chill out, and what better way than to sit in an inflatable ring as you float along Cross Country Creek. 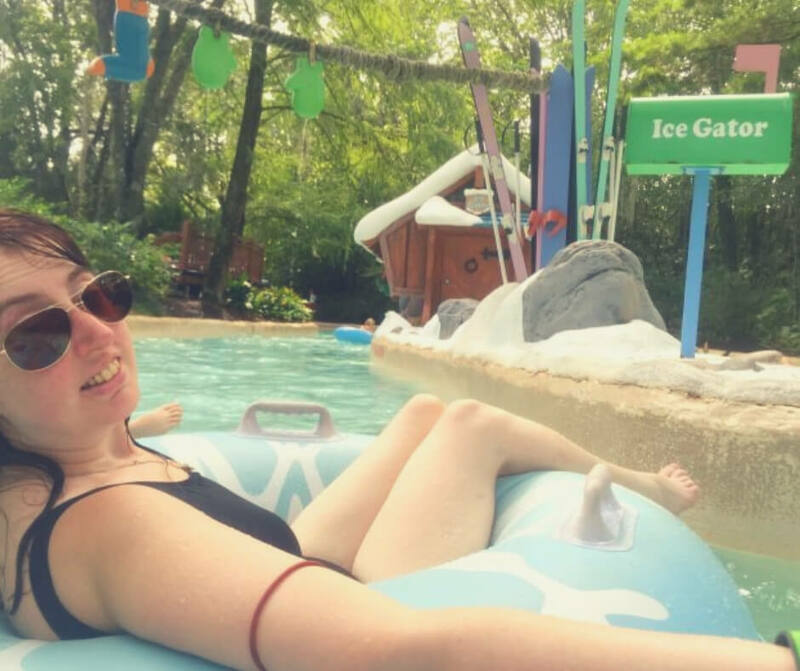 This lazy river is THE BEST way to relax in Blizzard Beach despite there being plenty of seats and loungers on the 'beach'. You float along the river nicely until you reach a tunnel, which if you're unlucky you'll end up going under a waterfall where tons of water land on your head! But it's all good fun, because when you emerge from the tunnel the sun will be shining and you'll dry off again in no time. Oh, and don't forget to look out for the Ice Gator! Look out for the Ice Gator along Cross Country Creek! 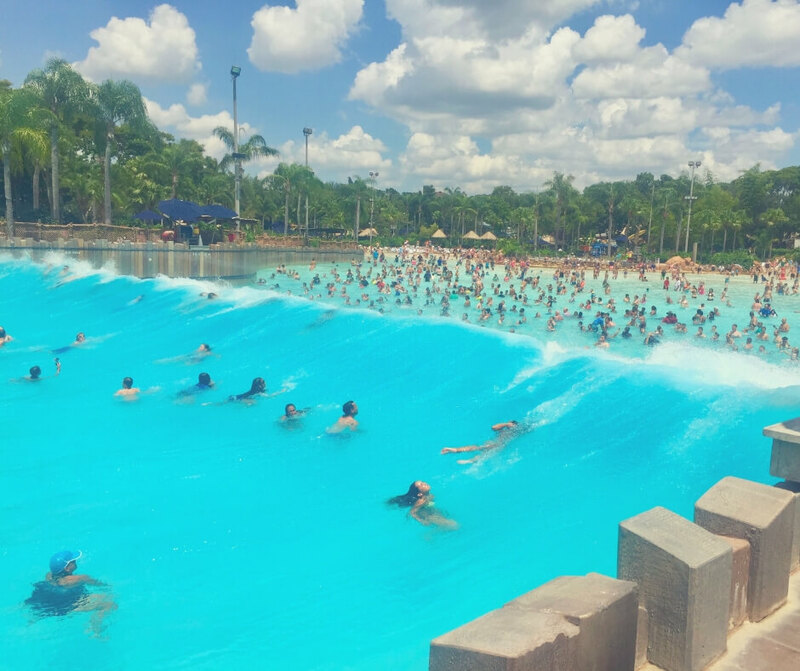 While Typhoon Lagoon is my boys' favourite water park Blizzard Beach is mine, there are more rides I enjoy as well as the lazy river being more relaxing. 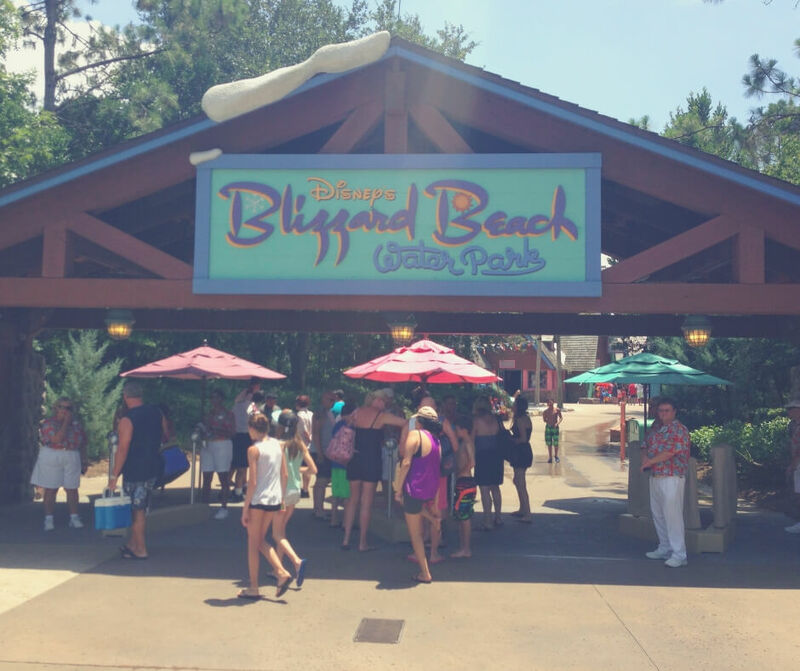 Which ride would you brave at Blizzard Beach? 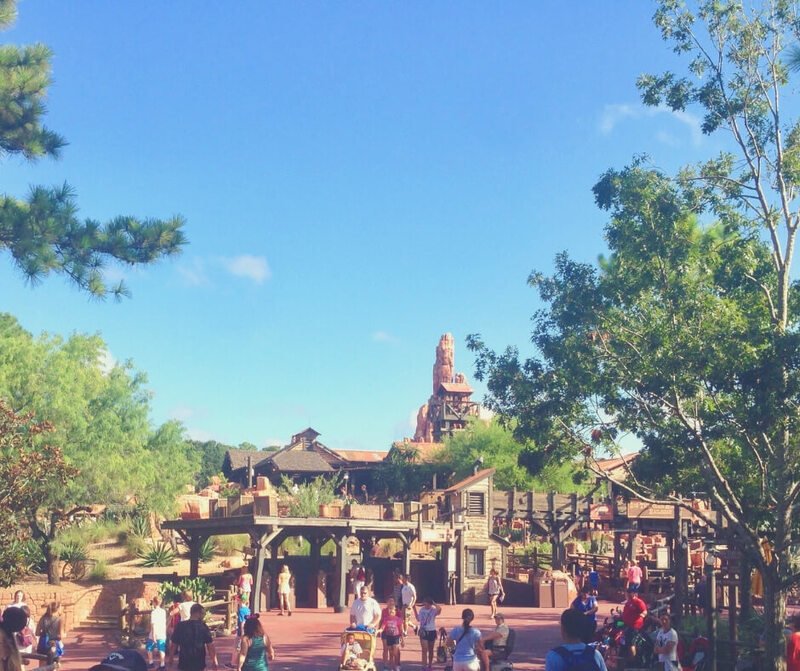 If you enjoyed this post you'll like Top 7 things you should do at Magic Kingdom or if you're planning your trip and would like to know more about what to do, check out Everything you need to know about Fastpass+. Stop by Facebook and let me know which ride you're most looking forward to. To keep your kids busy on the plane when you're jetting off to Walt Disney World grab this activity book, it's got a word search, a crossword, and more! In the lead up to Christmas we're always rushing around trying to get it all done. We don't give ourselves a break, we push ourselves to the limit and end up feeling rubbish because we didn't get something done. It can end up leaving us feeling like we're not good enough, and that influences how we treat everyone else. So this Christmas don't forget to take a step back to appreciate all the good things, despite the Christmas craziness. Preparing for the big day is madness. Buying all the gifts, shopping in the city with hundreds of other shoppers - all driving each other crazy. But you can enjoy this stage. 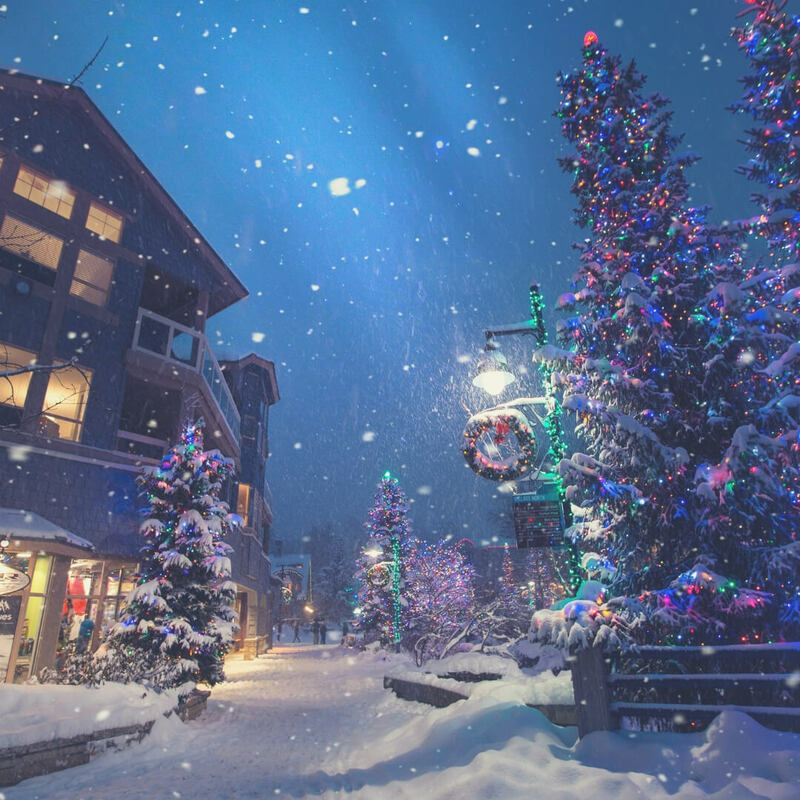 Look at the wonderful way the town is decorated for Christmas, try to feel the Christmas magic! Perhaps you and your hubby could go shopping together and spend the day, not only making progress on the Christmas shopping but spending time together too! Don't just focus on getting the Christmas stuff done, have a meal while you're out, spoil each other, talk, even hold hands while you're walking through town. Reconnect at this festive time of year. It becomes a chore quickly and you wrap as fast as you can without a thought about what the recipient will think of the gift. It's time to make wrapping more fun! Have a glass of wine while wrapping, and try to think about how much the recipient will like the gift, particularly if it's your own kids. 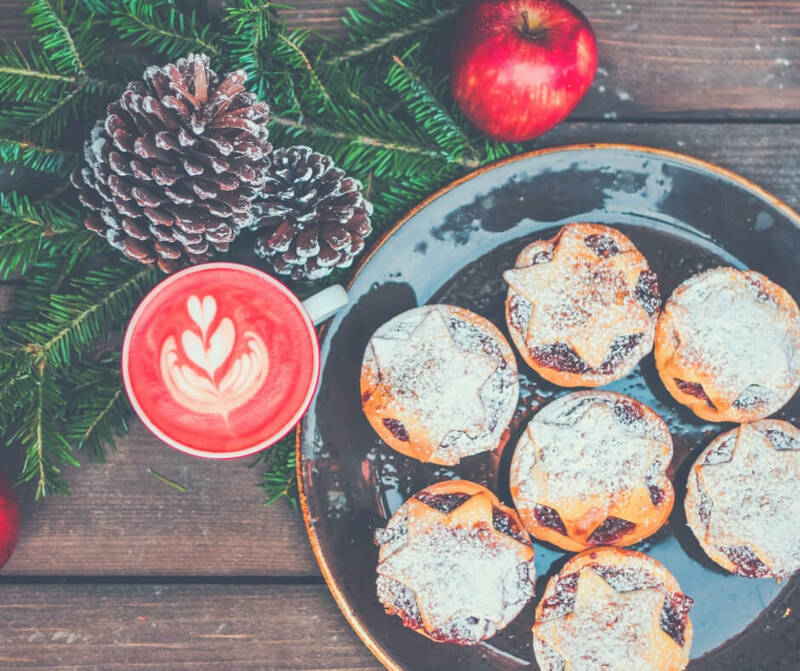 Play Christmas music, have mince pies, turn it into something you look forward to - rather than a chore! The Christmas craziness takes over and before you know the day is over and the kids are going to bed having opened all the presents. You blinked and didn't really get a chance to enjoy it. On Christmas Eve take a minute to enjoy the festive season together. Watch a Christmas movie, have a drink, play games, even start new traditions. Our Christmas Eve is always the same - after putting out a mince pie and bourbon (yes, Santa likes bourbon!) the kids go to bed and we finish the last of the wrapping (if there's any left to do), then arrange the presents in a new way. 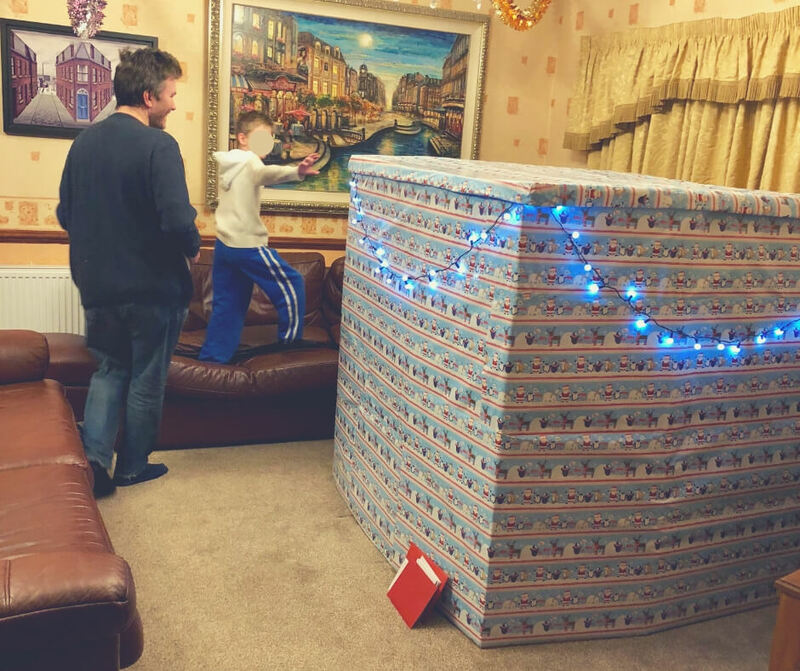 Every year we set out the presents a different way - one year we had a mountain of presents, one year we did a treasure hunt, and last year all the presents were inside a 'present house' - the boys love it so much and always look forward to finding out how Santa has decided to arrange the presents. Once that is finished we settle down ourselves and watch Love Actually. I've seen it so many times but I always look forward to this part of our tradition. The presents are open, the kids are playing with their new toys. Take a moment to look at your family and see how much you've enjoyed Christmas so far. Allow yourself a minute to take it all in and be thankful for all you have. 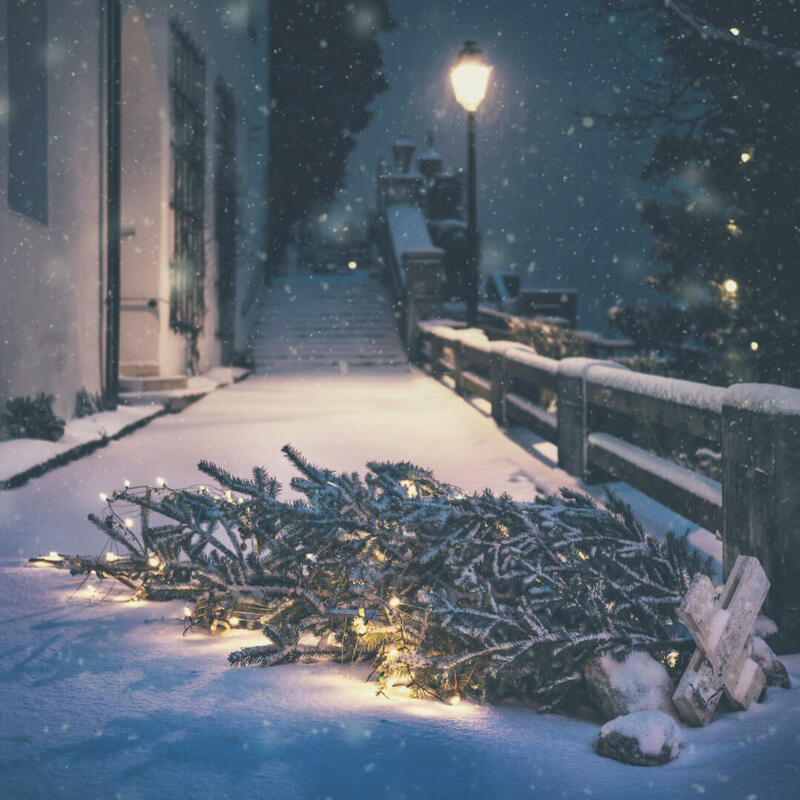 Christmas is a busy time but it is a wonderful time too - you just need to take a step back to see it. 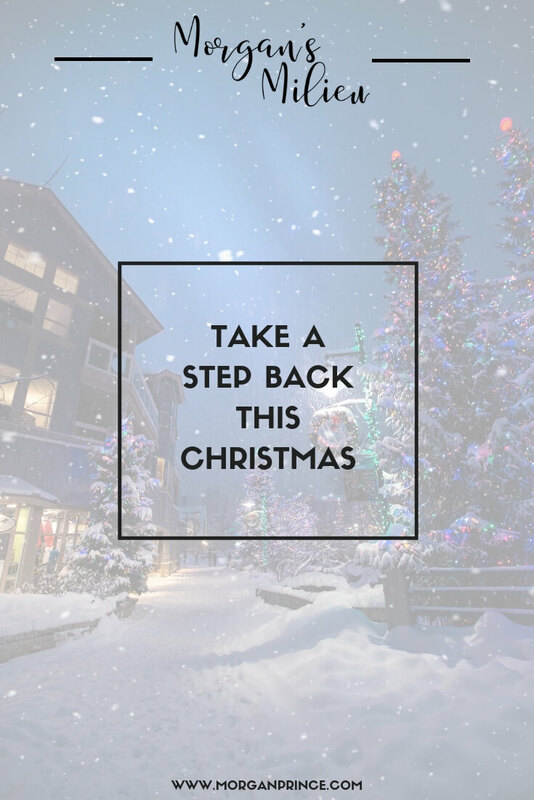 How will you be taking a step back this Christmas? 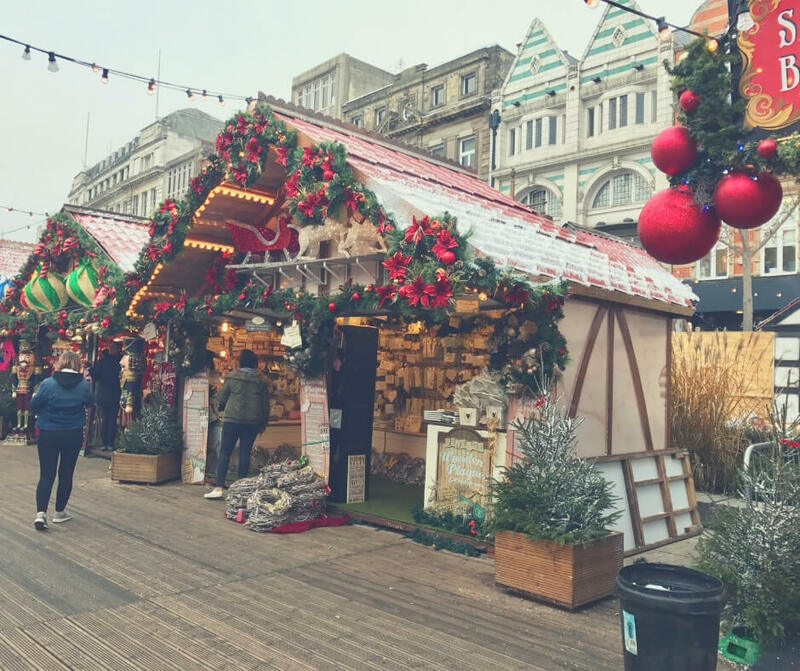 If you enjoyed this post you'll like Christmas gift ideas for your mother-in-law, or if you're looking for ways to get a little time alone during the festive season check out 5 ways you can get time for yourself this Christmas. Stop by Facebook and let me know how you're taking a step back this festive season. And to keep the kids busy so you can get the wrapping done why not grab this Christmas Activity Book? If you're planning a trip to Walt Disney World next summer you really shouldn't miss out on the water parks, Typhoon Lagoon is one of them. There's so much fun to be had in the Florida sun and it's not just in the theme parks - the water parks are fun too. 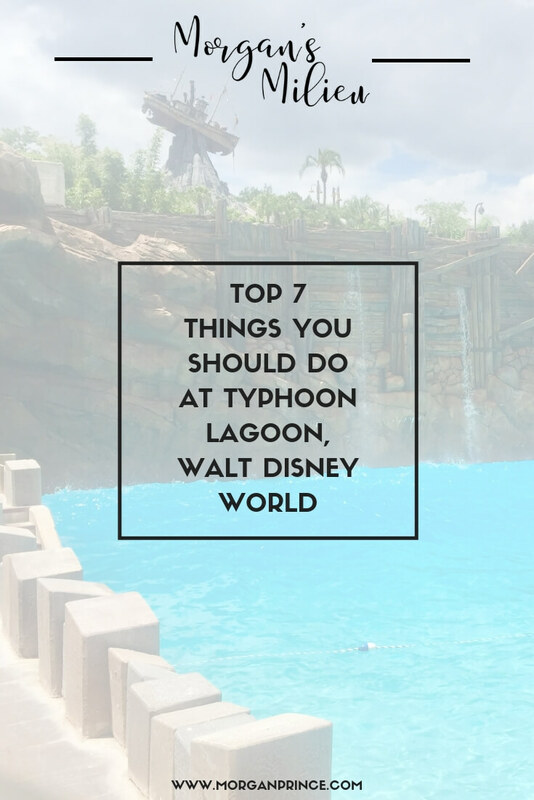 So with that in mind here's 7 things you should do at Typhoon Lagoon. A "water-coaster" that you ride in pairs is definitely one of the best rides. Despite being someone who hates roller coasters I do love Crush 'n' Gusher. I usually ride with the Hubby but a couple of times I've been on with BP, and I always have a brilliant time (I do scream on the way down!). There are lots of drops and turns but it doesn't last long and you float onto the pool at the bottom when you're finished. Lots of fun. The biggest body slide in Typhoon Lagoon, the kids gave this one a go. I ducked out of this one because I don't really like body slides, but the boys said it was fun. The slide is big but doesn't last long, just hold onto your shorts as you come down! Maps around the park will tell you where to find everything. More body slides, but this time they're winding and lots of fun. There are lots of slides at Typhoon Lagoon and these are among the best. Do not forget to ride the storm slides! For the little ones in your party there's Ketchakiddee Creek, where they can play around in the small themed water park. There are small slides, pools, and water spurts out all over the place. The younger kids are sure to have a fabulous time here. Let your kids run wild at Ketchakiddee Creek! 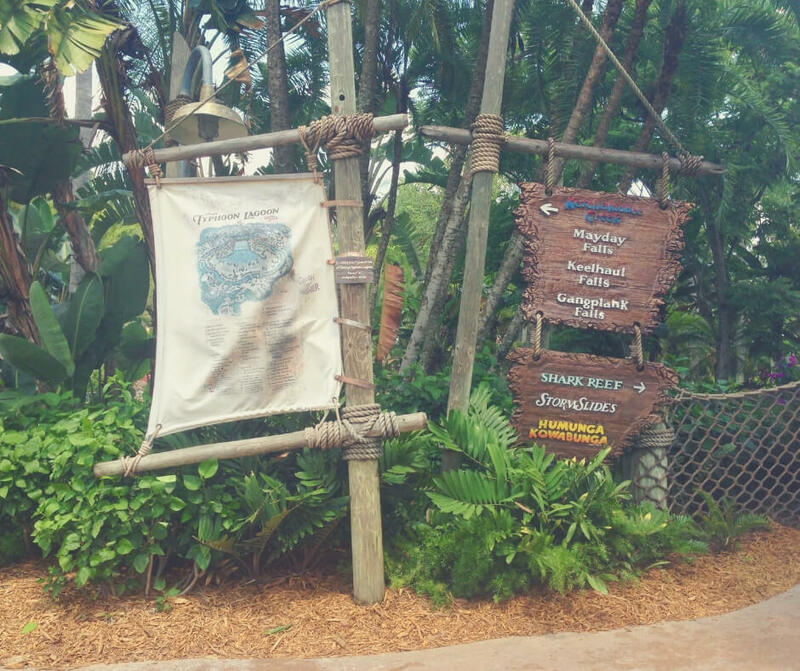 A family raft ride, and Typhoon Lagoon's newest addition, this is one of the best rides at Typhoon Lagoon. The raft can carry up to 4 people, and luckily there's four of us in our family so we were able to ride together. We had lots of fun, although if you don't like to ride backwards sit opposite the person who does! The perfect place to sit and relax. Sit yourself in an inflatable ring and float around the lazy river as you watch the world, and the other tourists, drift by. After a morning of going on fast water rides you'll be thankful for a rest in Castaway Creek - just look out for those sneaky kids or squirt you with the water guns at the side of the creek. I've saved the best for last - the surf pool. Now it doesn't look like much fun when the waves aren't going but believe me, it's lots of fun. Head into the pool and wait for the tidal wave that will surely knock you off your feet. Again and again the wave will head towards you. If you're brave enough head to where the pool is deepest, funnily enough the wave isn't as strong here! The boys loved swimming up on top of the wave as it headed through the pool. 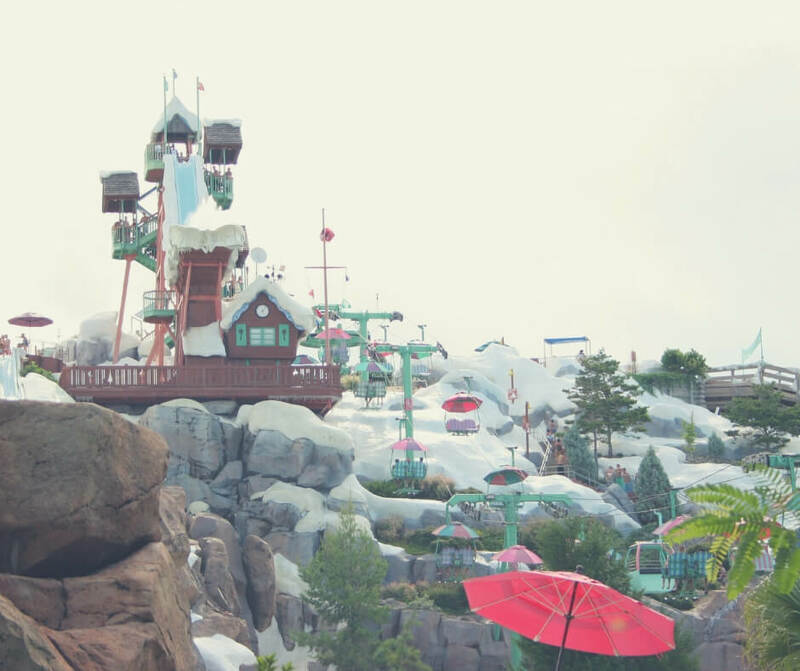 As a result Typhoon Lagoon is their favourite water park. The boys love swimming along the top of the wave! 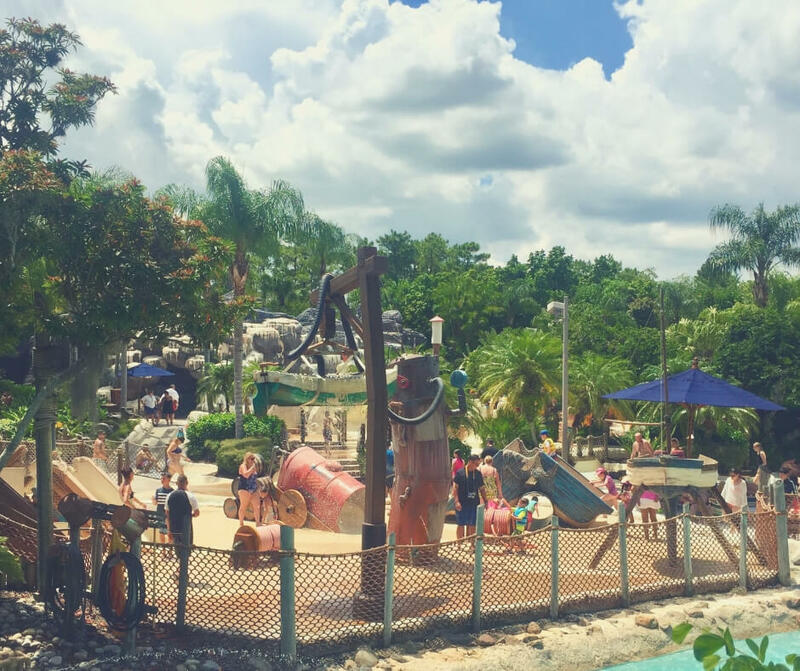 Spending time at the water parks in Walt Disney World isn't many people's priority but there are definitely things not to miss here. We often spend a morning having fun on the slides and then chill out in Castaway Creek before heading to a park in the afternoons. 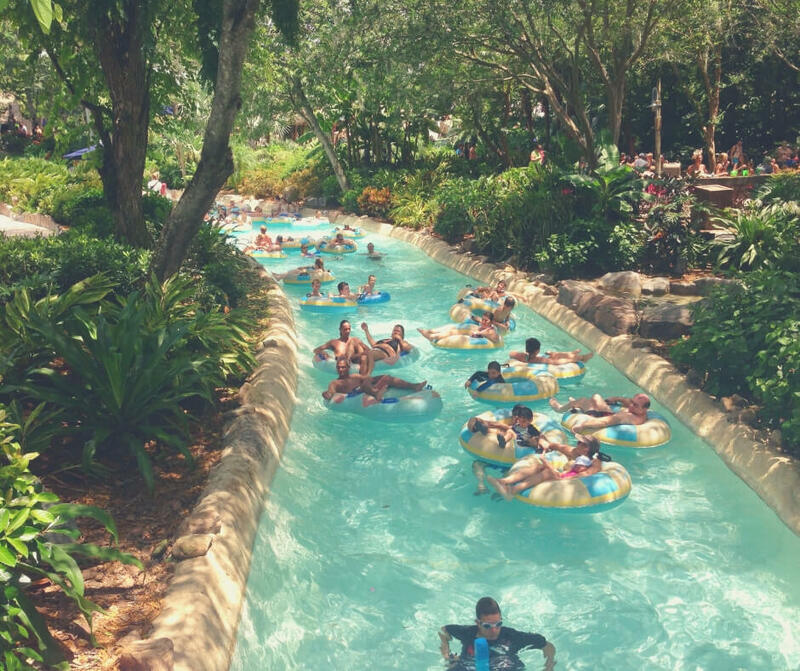 Which slide would you go for at Typhoon Lagoon? 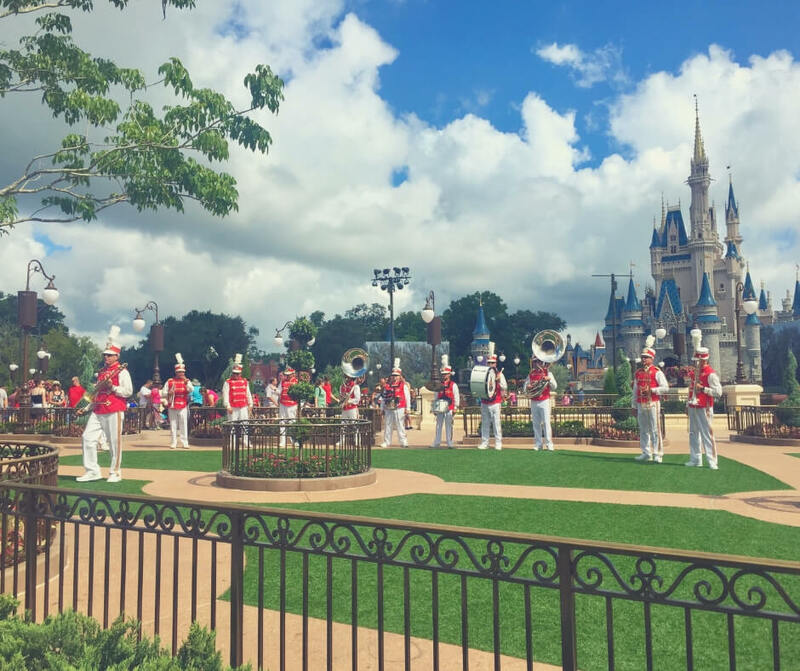 If you liked this post you'll like How to get a much-needed rest at Magic Kingdom or if you'd like to read more about how to have fun check out Why it's okay to act like a child in Walt Disney World. 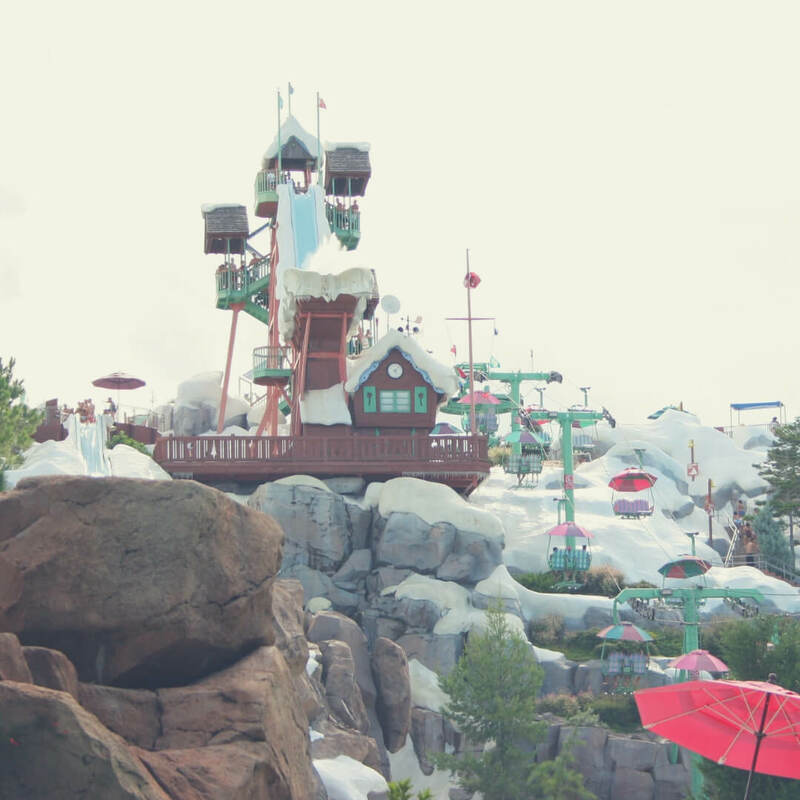 Stop by Facebook and let me know what you like most about Typhoon Lagoon. 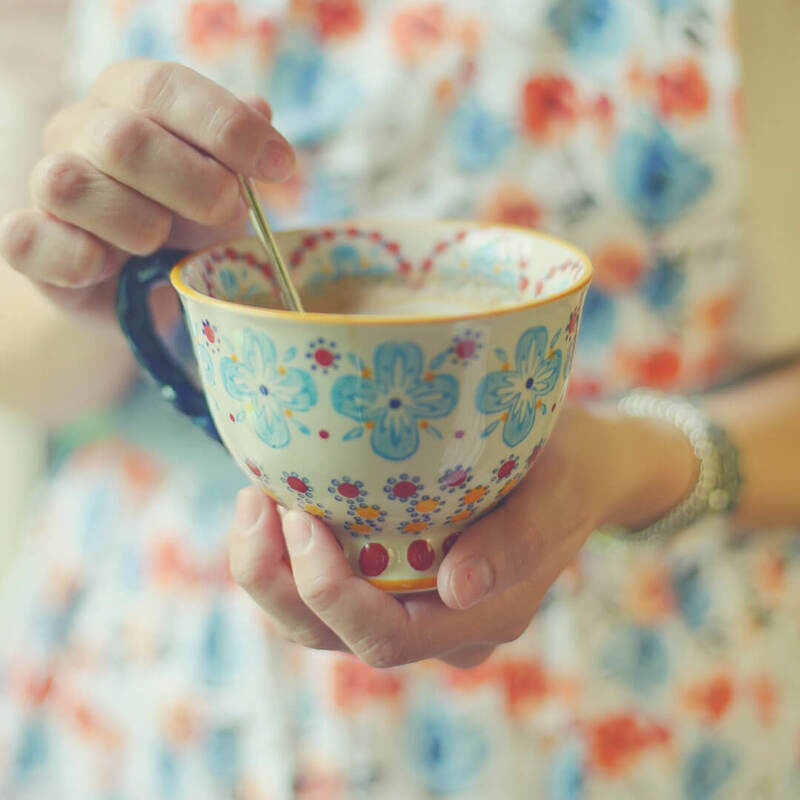 Let me help you get time for yourself - you want to enjoy a hot coffee right? Learn to be YOU again. Us mums fight battles all the time, from getting the kids up in a morning to making them go to bed, there's always some reason for us to battle. And, of course, Christmas is no different - in fact we probably have lots of new battles as well as the regular ones. 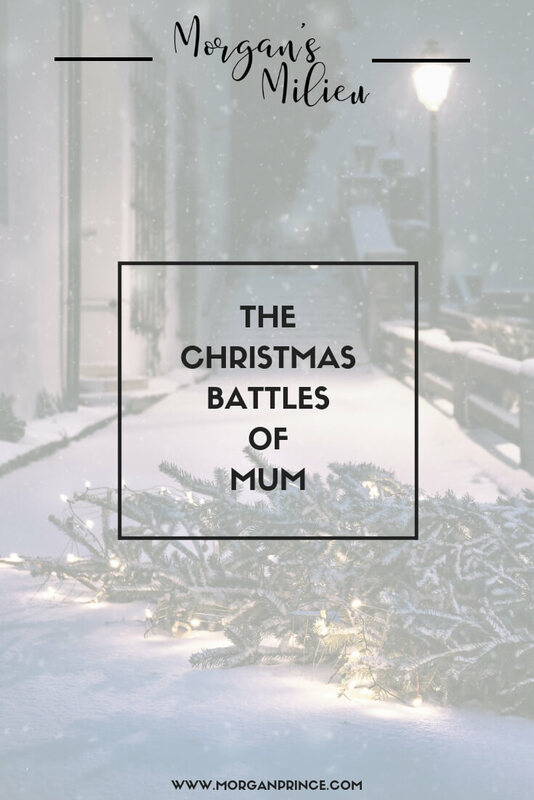 How many of these Christmas battles of Mum do you fight? I've lost count of the number of times Hubby and I have had to run through the house trying to hide the fact that we're playing Santa. Rushing from the kitchen, past the stairs and the gallery landing, into the lounge where we set the presents in whichever way we've decided that year. We - or rather Santa - have a running theme for our presents -- One year we had a mountain of gifts, one year we had a treasure hunt for gifts, and last year all the gifts were in a huge present house. The kids look forward to seeing how Santa will decide to do the gifts every year - even though they're getting older! There's always that one toy that requires batteries you don't have. No matter how much planning you do you can't be prepared enough for the frustration you'll feel when you see a toy requires C batteries. I keep a stock of batteries in the kitchen, we've always got plenty of AA and AAA batteries, but when it comes to the others because we need them so infrequently it's pointless keeping them in stock. Which means when it comes to Christmas gifts we have to hope none of them need the bigger batteries. Luckily with older children that's rarely the case. After the excitement of opening presents you then have to deal with boxes upon boxes of new toys, all of which are secured with a billion cable ties - fun! Pulling at sellotape and cable ties while you try not to curse at the tiny little toy that seems to need a degree in rocket science to remove it from its box. On Christmas morning I have a list of things I get together and scissors are on my list. I learned quickly that trying to open any toy without scissors handy is a huge mistake and scissors are my friend. Not to mention having chocolate to hand (because it's probably too early for bourbon!) - for you and your kids! You'd think with all the new toys the kids wouldn't be able to get bored, yet still, by the end of the day, you'll have heard those dreaded words at least once. In order to banish the boredom have plenty of activities planned - we have activity books, colouring sheets, even a pool table to keep the boys busy. Board games, days out, even movie time, and the kids want to do every single one on Christmas day. One of our outings - this was Warwick Castle, later in the year. 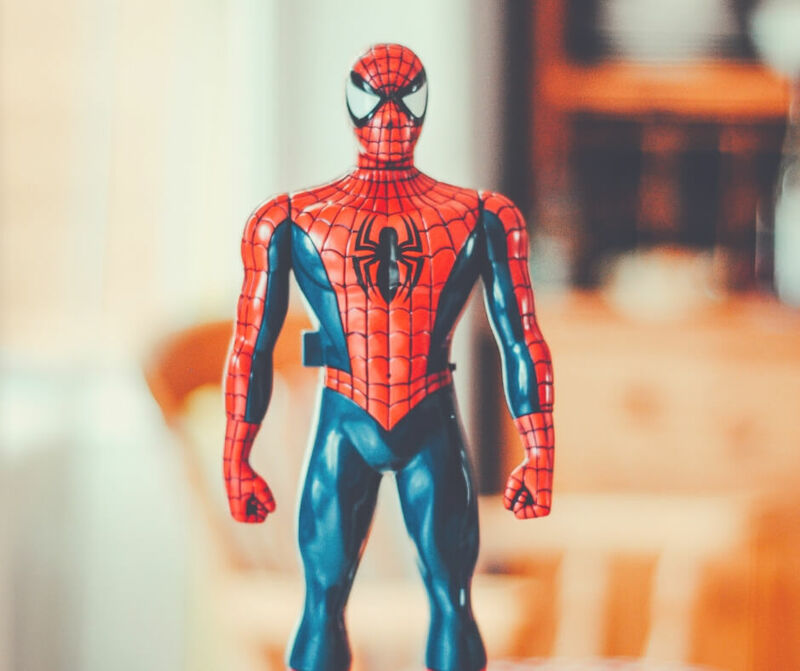 We give our boys vouchers for days out, buy new board games, and take them to the cinema to see new movies, but most of the time they want to do all the things on Christmas Day. It's frustrating having to say no, especially on Christmas Day, but we like to save some of the activities for later in the year. No longer can you threaten to tell Santa about bad behaviour. Now you have to deal with it, and yes, even though it's Christmas Day they'll still bicker! The threat of telling Santa about bad behaviour can work wonders before the big day, but as the kids are sitting opening their gifts they somehow realise that you can't threaten them any more and the behaviour often takes a dive. It's almost as if they've been saving up bad behaviour credits to be used at a later date. Of course these are just little gripes and to be honest Christmas time is one of my favourite times as a mum. I don't really fight battles, I just referee most of the time, and I always focus on the good. After all Christmas is a time to be spent with the people we love and I do love my boys - all three of them. Will you be fighting these Christmas battles or will you just ignore them and enjoy Christmas Day? 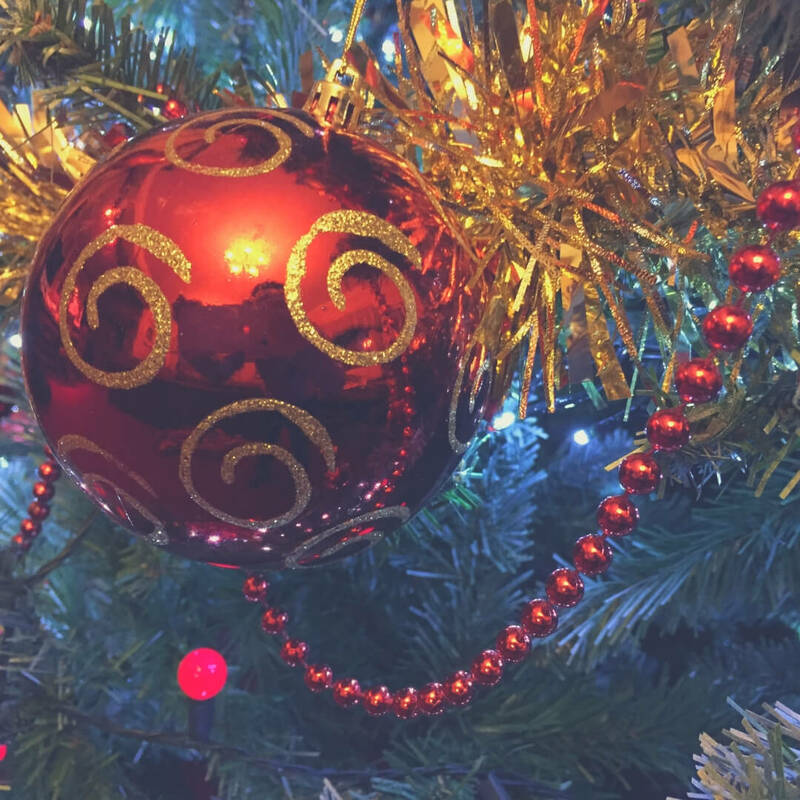 If you enjoyed this post you'll like The battles of Mum or if you'd like to hear more about the magic of Christmas check out What I love about Christmas. Stop by Facebook and let me know how you tackle your Christmas battles. And to help you with keeping the kids busy (so you can get more wrapping done) why not grab this Christmas Activity Book? It's Friday again and that can only mean one thing - it's time for Post Comment Love. Join Stephanie and me, link up your favourite or best post of the week and we'll stop by to give it some love! We welcome all bloggers, all topics, and we always look forward to seeing the different kind of posts that are linked up. 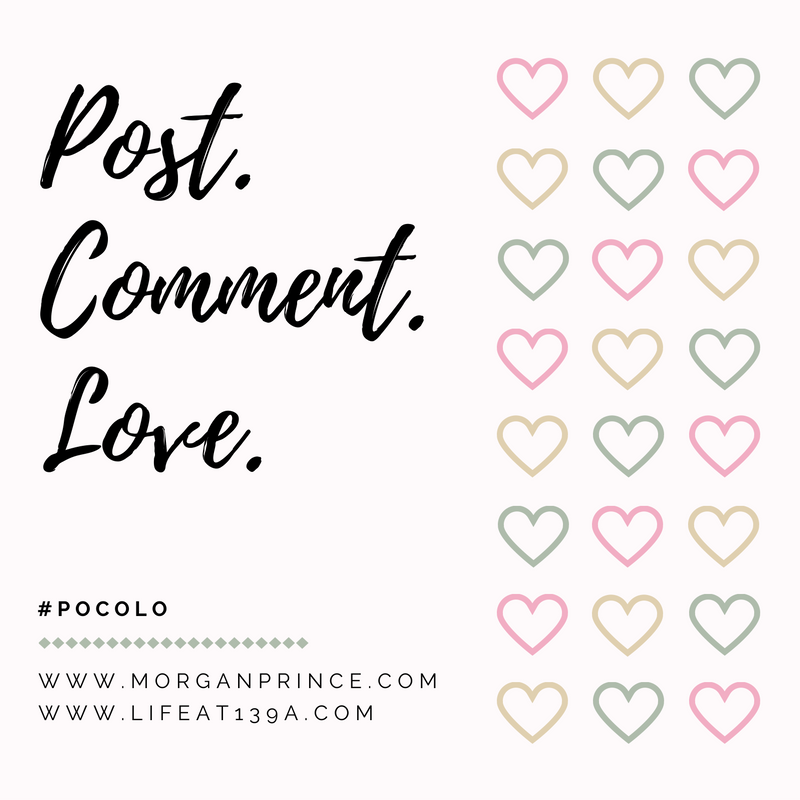 With Christmas Day looming and the craziness that comes with wrapping hundreds of presents we're going to be taking a Post Comment Love break. So, this week is the last week of Post Comment Love for 2018 and we'll be returning on 11th January 2019. I want to take a moment to thank every one of you that continues to link up every week, we're so grateful that you've kept this little linky going all these years! It's been a busy week for us this week, we've spent some time shopping (we're not done with Christmas shopping yet!) and we're almost finished. I'm lucky this year that I don't have to plan for cooking Christmas Lunch for 20 people - we're eating out on Christmas Day! It's a little pub we found in our local are and it looks lovely, and I'm so looking forward to having a Christmas Day where I don't have to cook! It'll be the first time since becoming a mum - that's 14 years! I think I'm the only one that's this excited about eating out but it's going to be SO good. I am going to take this break and spend time with my family, we'll be playing plenty of board games and console games, we'll talk and enjoy our favourite movies - but most of all we'll be together. And I cannot wait! I want to take a moment to wish you all a Merry Christmas and a Happy New Year. What you do have planned for the Christmas break? My name is Jo and I’m an almost 47 year old mum to an almost 3 year old toddler. I blog at www.arosetintedworld.co.uk and live in Leeds in the UK. About a year ago I gave up my career of 23 years. I was feeling unfulfilled being a dentist with the company I worked for. As a new mother I also wanted to spend more time watching my little one discover the world. I’d also recently taken up sewing and found a new community of bloggers and businesses over on Instagram. I realised that I have a lot of life experiences that I wanted to share and blogging seemed the ideal way to do that. It would also connect me more to my new found sewing passion, and allow me to blog about my new life! Finding the time to do it all! I honestly take my hat off to people who fit this in and work full time. 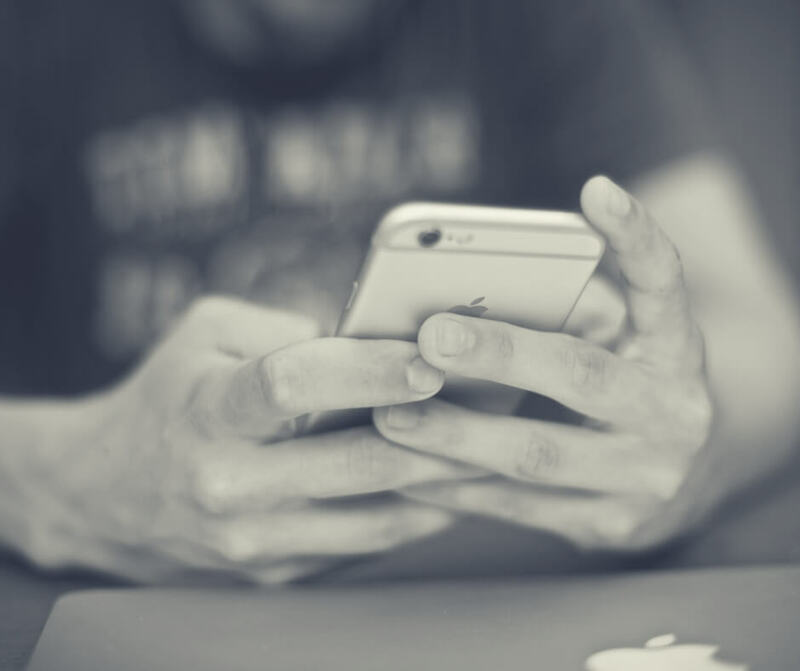 Creating content and networking for the blog can be a full time job. I have a long list of to-dos that I really need to get around to. I am challenged daily by time. 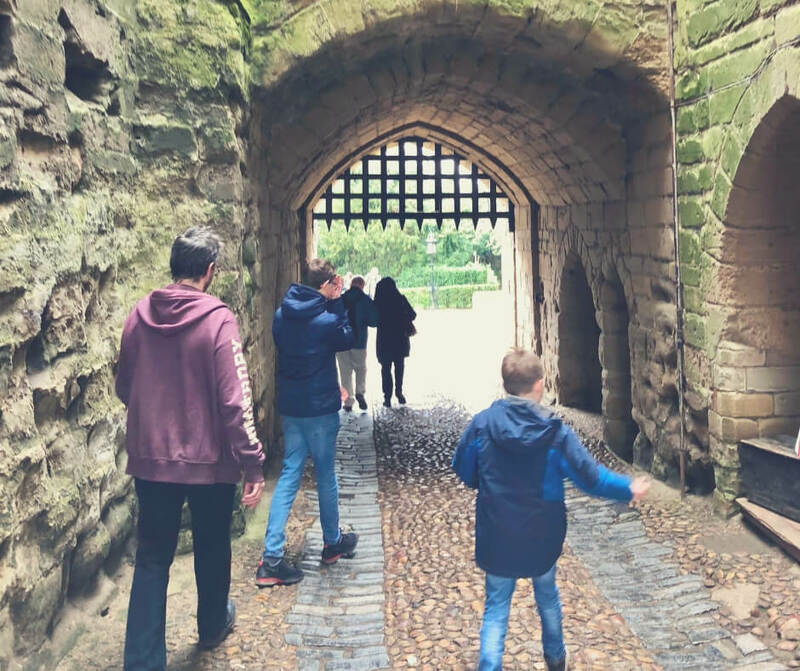 My favourite topic to write about is being an older mum and the challenges I’ve had with that. Being a mother is often a very demanding job, no matter what your age. As women are having children later due to careers I do think that it’s an important topic to cover. There were lots of reasons why I left having children until later but my career was definitely one of them. Ironically, being a mother was one of the reasons I decided that my career had to take a back seat for a while! I am blogging for myself at the moment, but do hope to build a little bit of a business from it. I did have a goal of having an Etsy shop but blogging has taken over from that. I have made tentative steps into the affiliate world but haven’t gone totally down that road yet. My favourite thing about blogging is finding other people who share my views. It is great to find people who are going through the same battles and share hints and tips. Though I also love finding completely different points of view that are the total opposite of mine. The community is much more diverse than I ever imagined, and I have learnt so much in the last couple of months. I have never attended a blogging conference. I think I would be a bit shy at the moment. I’m such a newbie. 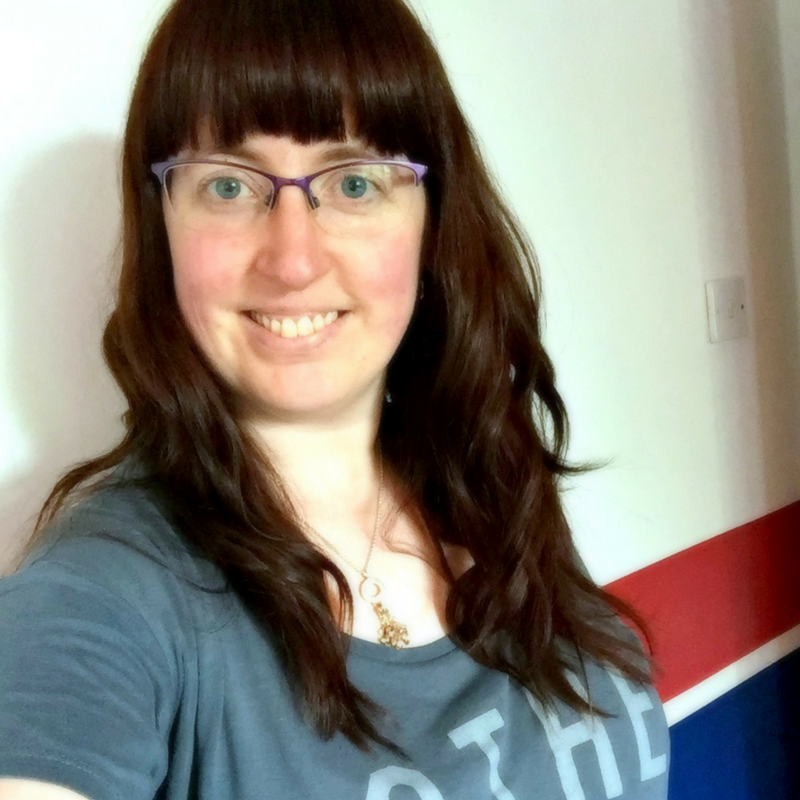 https://www.arosetintedworld.co.uk/pregnant-at-43-being-an-older-mum/ about how I came to be an older mum and my pregnancy. Which are great simple tips to follow if you want to lose weight. A list of what makes me happy, and why it’s important to be grateful for what we already have. In 3 words, I would say I’m kind, intelligent and passionate. I’m definitely a coffee and cake person. The only tea I drink is red bush. My perfect night out is going into town with my close friends. I’ve 3 very good friends, two of which I’ve known since school. We often find something a bit different to do rather than just drinking, so we could go do an escape game or book a karaoke room. I sing a mean show tune! My perfect night in would be dinner with my close family. My brother has a daughter who is 4 months older than my little one. It’s wonderful to watch them get together. My other half would say that my best quality is my sense of humour. He says that I should show it more in my blogs. I tell him that he needs to shut up, concentrate on finishing that dusting and that the cat litter will need doing later. 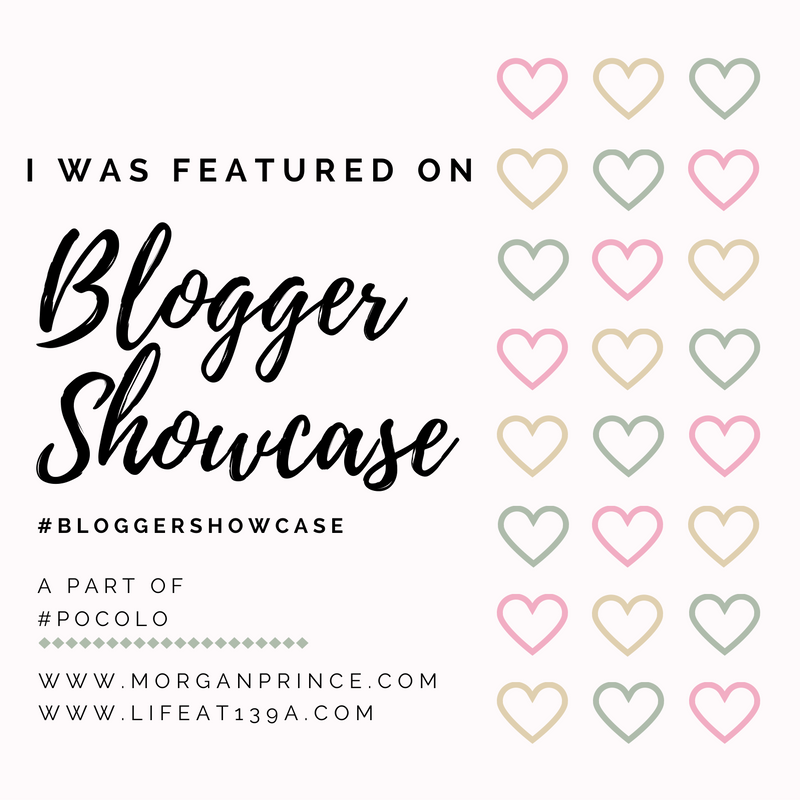 Thank you for taking the time to answer our questions Jo, and feel free to grab our featured badge and display it ever-so-proudly on your blog. 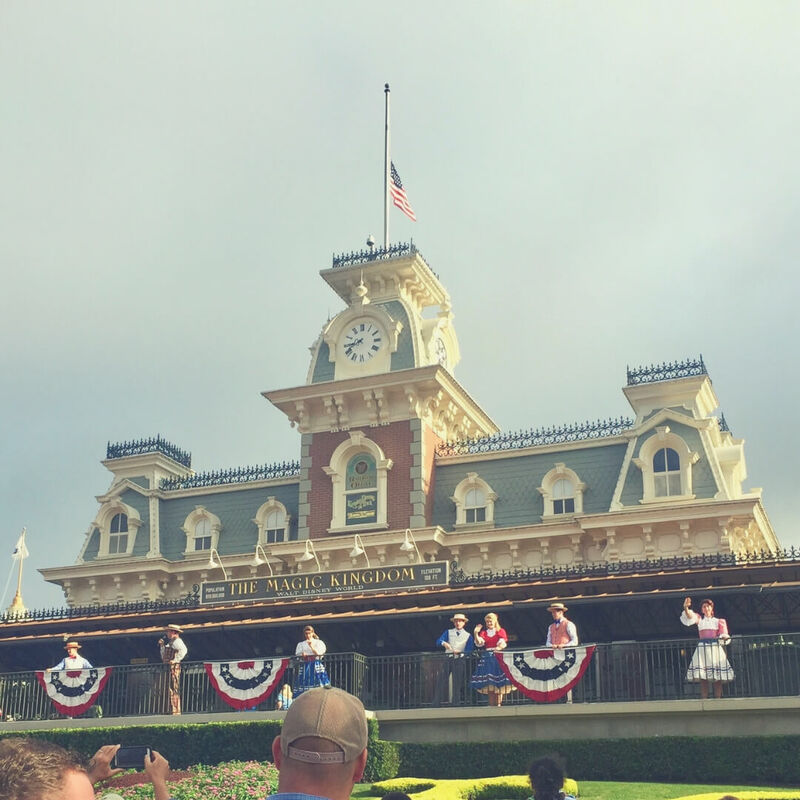 Magic Kingdom is one of the largest parks in Walt Disney World and knowing which rides you should check out or where to see the best sights can be an issue if you're only there for a short time. 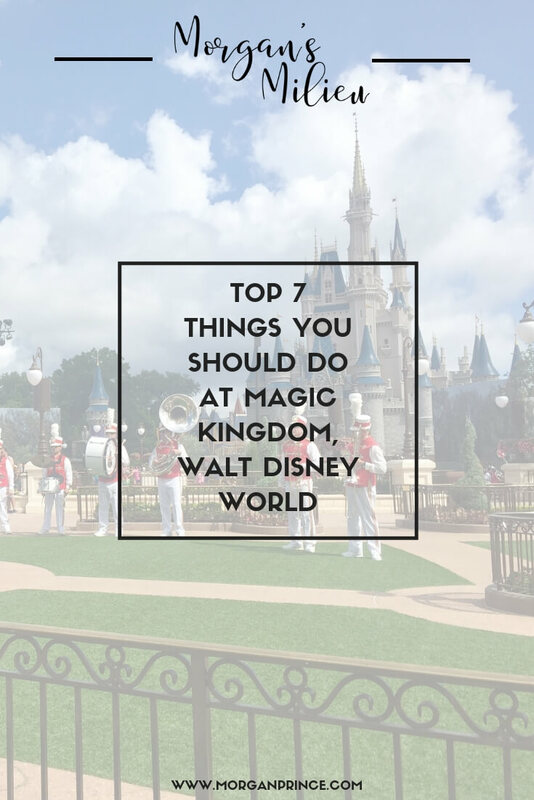 That's why I've put together this quick guide of the top 7 things you should do at Magic Kingdom. Sit in a constantly moving spaceship as you point your laser gun and shoot at targets to get as high a score as you can! Buzz Lightyear's Space Ranger Spin is a fantastic family ride that everyone will enjoy. You may even get friendly family rivals as everyone tries to beat each other's scores. It can get busy, particularly during the busy times of the year (summer, Christmas) so if you can I would book your Fastpass+. Of all the roller coasters at Magic Kingdom this one is my favourite. I'm not a big fan of coasters but I can cope with Big Thunder Mountain Railroad - just. It's quite up-and-down and it will definitely make your tummy flip but if you like roller coasters it's one not to miss. Again it can get busy so booking your Fastpass+ will guarantee you get to ride. If you're going to go on just one ride during your trip to Magic Kingdom make it It's a Small World. This classic gentle boat ride is so good you're guaranteed to smile when riding and you'll probably get off the boat singing the song! See little figures of children dressed in traditional clothing from their country as they sing and move around. Your kids will love it and anyone can ride. 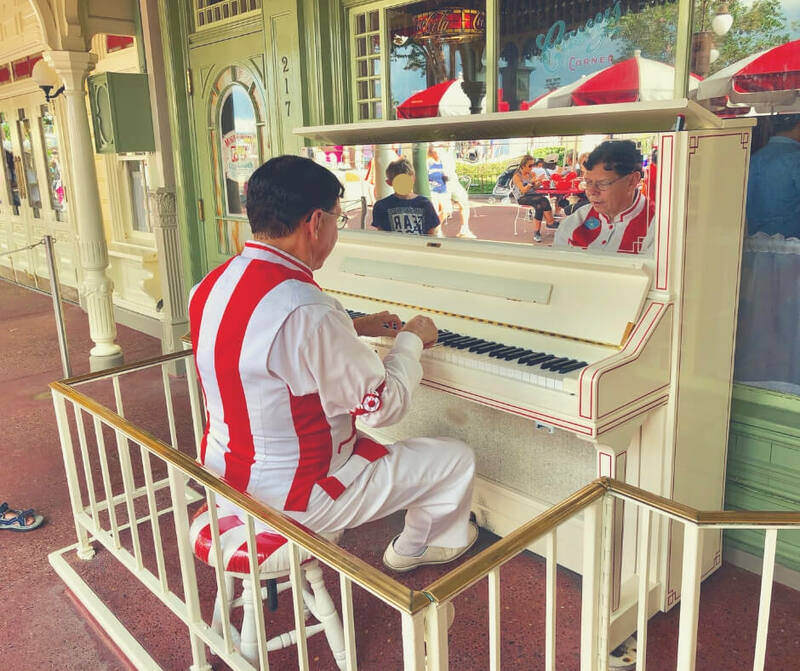 There's so much street entertainment in Magic Kingdom that it's hard to focus on any one as being the best but the Casey's Corner Pianist is on the must-see list. He'll amaze you with his talent, hitting the keys with such speed you wonder how on earth he manages it. He'll get you singing along with classic Disney songs, and maybe even introduce you to some old classics you don't even know. During our summer 2018 trip we stopped by to see the pianist a couple of times, and he even got LP involved in the piano playing! The pianist is talented and very entertaining. Another one of the street entertainers the Dapper Dans are not only brilliant singers but also very funny. They'll have you laughing and singing along with their song choices and you'll smile at their banter. 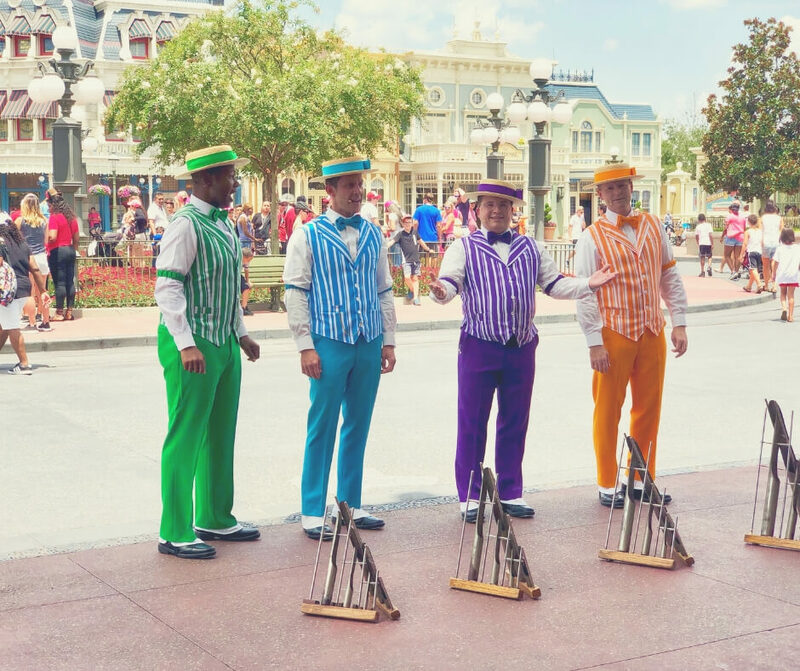 Dressed in matching suits of different colours and occasionally carrying musical instruments they're sure to bring a little magic to your day. I loved listening to the Dapper Dans singing. Main Street Philharmonic at Main Street U.S.A. It's quite a spectacle to see the orchestra playing songs on Main Street U.S.A. During our summer 2015 visit we stopped as they were performing in front of Cinderella's Castle and I could've stayed there for hours listening to them. Unfortunately it was just too hot to stay out in the sun, but if you can be sure to check out the Main Street Philharmonic. This night-time fireworks show should be on your MUST-DO list. Watch Disney animations projected onto the front of Cinderella's Castle as fireworks fly into the sky and amaze your children. Every time I see this show it brings tears to my eyes - standing in front of the Castle as you watch amazing fireworks and see the smile on your children's faces brings a lump to your throat. 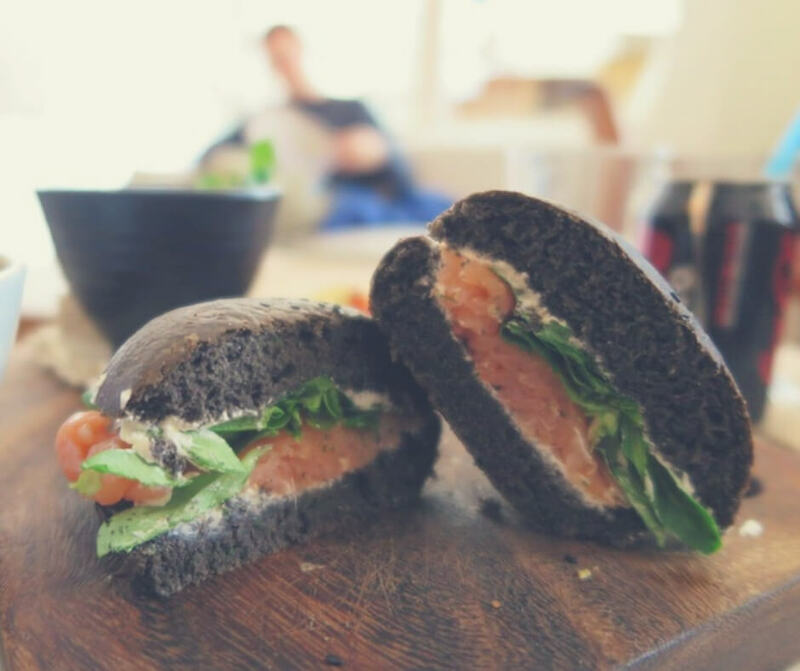 Why not grab a snack while you're there too - the kids will love it! What do you most look forward to seeing at Magic Kingdom? If you enjoyed this post you'll like Top 7 things to do at Epcot, Walt Disney World or if you're in need of some quiet time check out 11 ways to get a peaceful moment in Walt Disney World. Stop by Facebook and let me know your favourite street entertainer in Magic Kingdom. 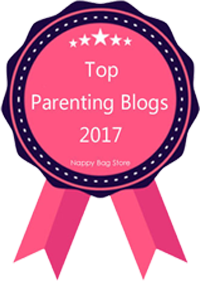 Get my posts straight to your inbox, as well as parenting emails, and the occasional freebie - join me today!